Our social circle in Bangalore had a friend I used to address as 'baking queen' because of her being enormously gifted in the art of baking. Indeed, she was the one to have first evoked an interest in me towards baking. Prior to I met her and had her baked goodies to the satisfaction of my gastronomy, I never ever gave baking any thought, neither serious nor casual. So our 'baking queen' often would throw cake parties just to indulge us, a group of ravenous foodies, with an impressive range of her baked goodies, from cake rolls to tootie fruities, from cinnamon rolls to three tier cakes. It was almost a ritual for her to invite us over to her place in celebration of any momentous or inconsequential event that would evidently end in with our feasting upon a huge two to three tier cake frosted with a super soft creamy icing that melted the very moment it went into mouths. Each of the cake parties organized by her only left me craving more for her baked goodies. She was so good. In one such cake party, she baked éclairs which were the first of its kind experience to me. I never had éclairs before. I had a strong urge brewing inside me at the very first mouthful of éclairs to try my hand upon baking and finally through a long series of trials and errors, I have mustered the art to a decent degree. 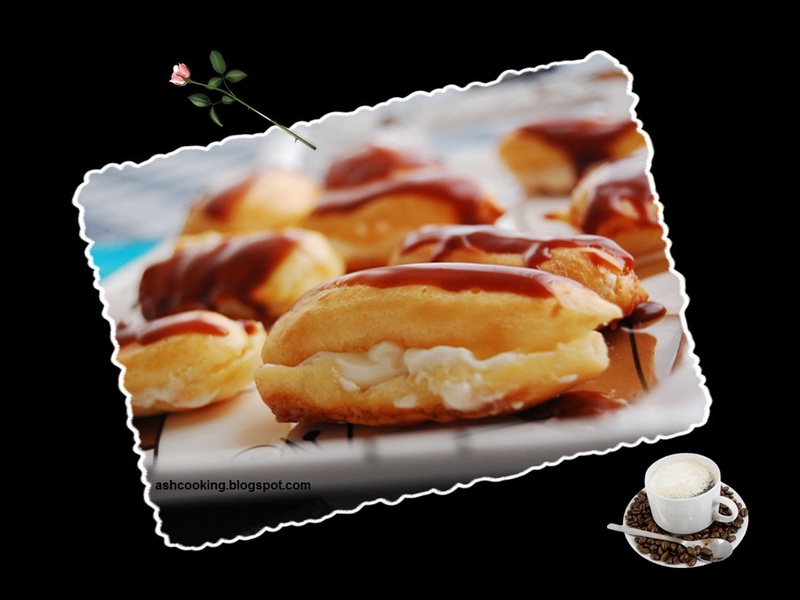 So few days back in a potluck dinner, I surprised my friends with my baked éclairs which with their melt in a mouth texture won the hearts of all leaving them crave for more. Needless to mention, it was only a matter of few moments when the plate heaped with éclairs was swept clean without a crumb. 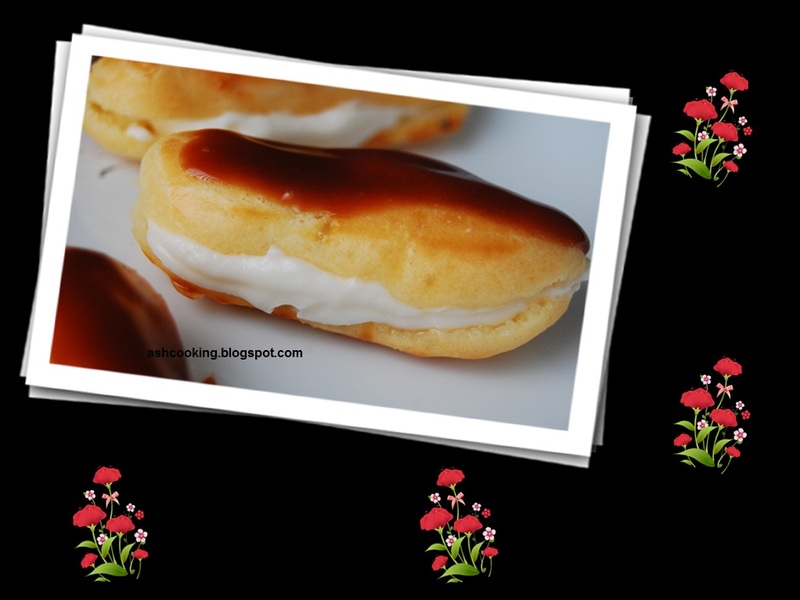 Such is the eating frenzy that éclairs trigger in a party. So be sure to make them in bulk. 1) For Éclairs: In a saucepan, put together milk, butter and salt and bring them to a boil. As the milk mixture comes to a boil, turn off the heat and stir in the flour until the dough is formed within a matter of few seconds. Stir vigorously until the dough is smooth and soft in texture. 2) Now break the eggs into the dough, one at a time and stir vigorously to help the eggs incorporate. 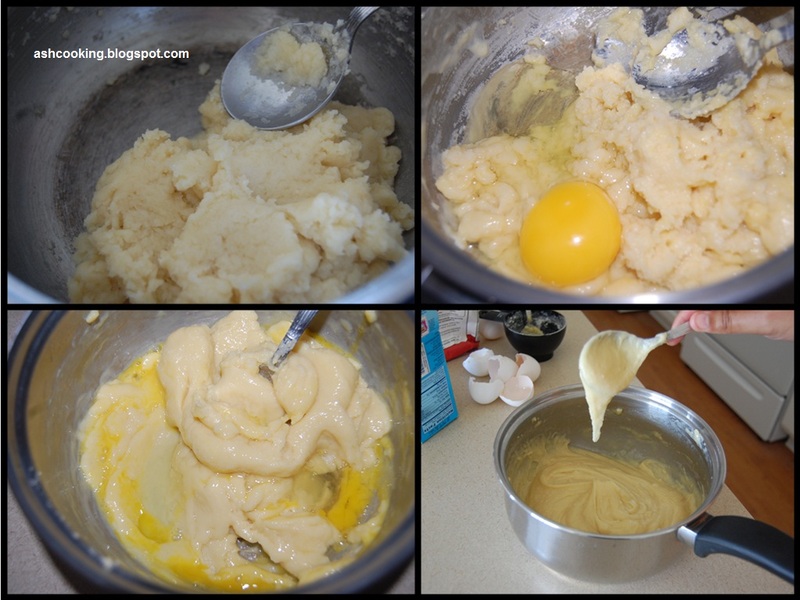 Break the 4th egg separately in a cup and whisk. Use half of it into the dough and reserve the remaining half for glazing. 3) When the eggs are nicely incorporated into the dough giving it a smooth shiny gloss, lift it with a spoon to ensure it falling back into the bowl in one string. 4) Line baking sheets with parchment paper and preheat the oven to 375 F/190C. Fill a large pastry bag fitted with a plain tip nozzle with the creamy dough and pipe it onto the baking sheets in 2 1/2 inch long strips. Leave at least an inch gap between each strips allowing them space to puff. 5) Use a silicon brush to coat the surface of the strips with the egg reserved for glazing. Once done and over with the glazing, slightly press a fork upon the strips to impress hash marks. 6) Bake the strips for about 15 minutes till firm and golden brown in color. Then turn off the oven and slip a wooden spoon or ladle into the door to keep it ajar. Keep the éclairs there for 15 minutes more till you get ready for filling. 7) For filling, using a hand blender beat the ingredients together until creamy and fluffy. Now split the éclairs in half lengthwise with the ends still attached, pipe the filling in a mound onto the bottom half and cover it with the upper half. 8) Next comes glazing, put together all the ingredients in a bowl and either in a microwave or on stovetop, heat the mixture till the butterscotch chips are melted. Cool it down for 10 minutes. 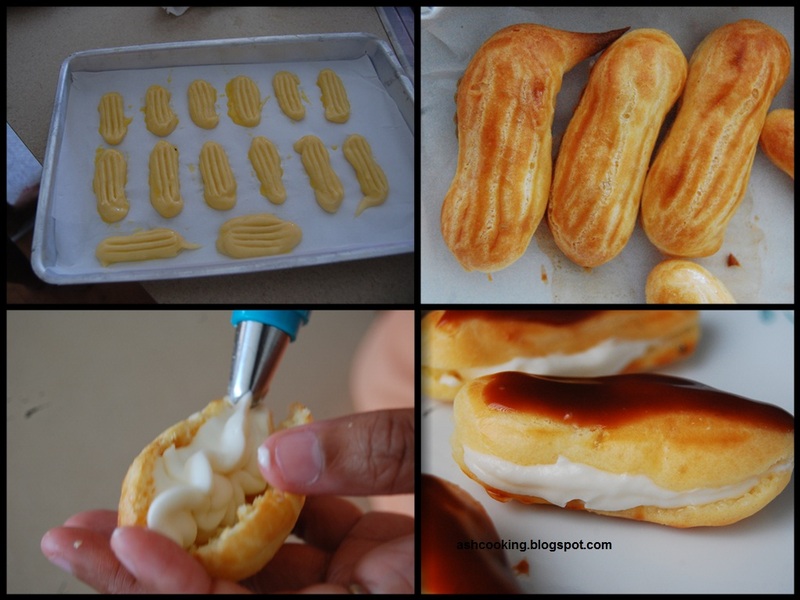 9) Then using a frosting spreader or a dinner knife spread the mixture lightly on top of each éclairs. Let them cool for half an hour at least till the butterscotch spread on top stiffens. 10) Serve at room temperature and luxuriate in the melting-in-a-mouth experience.